DIN Standards are issued for a variety of components including industrial fasteners as DIN 417 Slotted Set Screws with Long Dog Point. DIN 417 Screws are manufactured from Austenitic stainless steel A2 and A4, Low or Medium Carbon Steel, Brass or Alloy Steel. DIN 417 Screws are available in a wide range of sizes, shapes and materials. DIN 417 Set screws are available with a cylindrical end and a straight slot, accuracy classes A and B.
DIN 417 Screws have thread metric single pass, accuracy class B. The transmission of toque is carried out through the straight slot with the help of a universal metalwork. Complies with GOST 1478-93 and ISO 7435. 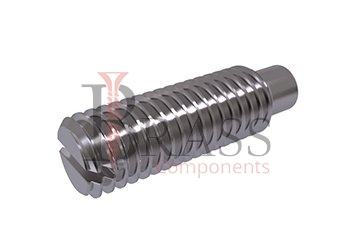 The end of DIN 417 set screw has a special cylindrical shape, which serves to fix the products relative to each other. The range of DIN 417 Screws simplify the assembly-disassembly process. DIN 417 Screws ensure high assembly accuracy. If the adjusting DIN 417 screw is used in closed unit, then the use of unshielded hardware is allowed. The Clamping Force is generated through the bottom tip of the range of DIN 417 screws which projects through the outer object into or against the inner object. 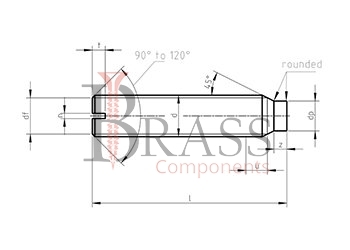 DIN 417 Screws has the dog point which is a flat tip protruding from opposite end from the slotted drive and is usually positioned into a groove or shaft allowing to rotate while keeping the part in place of shaft. The range of DIN 417 Screws are used for work in aggressive environments. DIN 417 Screws are used to secure one object within or against another. German DIN 417 Screws used to prevent relative motion between two rotating parts such as movement of a pulley or a gear on a shaft. Standard range of DIN 417 Screws are used in Machine Tool Construction. DIN 417 Screws are widely used in General Mechanical Engineering. German Standard DIN 417 Screws are for mutual fixation of mating parts and for power fastening. General range of DIN 417 Screws are available for tightening or loosening. We manufacture DIN 417 Screws as per Custom Specification and export in France, Italy, Switzerland, Poland, Greece, UK and other European Countries. For more Information, Please Contact Us or Inquiry Now.